We “social masters” are tired of being discriminated against. Why all of these “one friend, two piece” necklaces? I could never give one of my minions special treatment, because then my other minions would feel sad. I value my worthless social minions, and am excited to hear that I can now include them all! Thanks, Pizza Slice Friendship Necklace! Next, you will need to purchase the beautiful piece(s) of jewelry shown above. 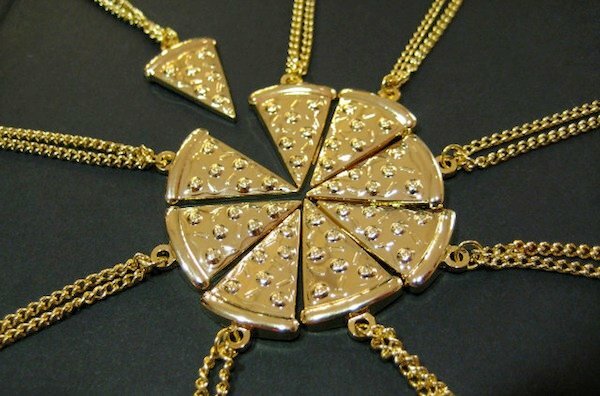 The only thing left for you to do, after having purchased the Pizza Slice Friendship Necklaces, is to force your eight friends to wear them. If you need to accidentally on purpose make your friends go temporarily unconscious, then do what you have to do. And if you get caught, I was telling you the whole time that it is entirely illegal and immoral to ask unconscious people to befriend you. Only befriend conscious people – they are less likely to have diseases and will stay friends with you for a longer period of time. You can pick up one of these Pizza Slice Necklaces for £14 (~$19 USD) over at the Lazy Oaf online store. Lazy oaf.